Vapor Krew is the main leading vape shops in Florida offering best quality vape e juice & e liquid online at best possible prices. Buy the Best vape juice online today! 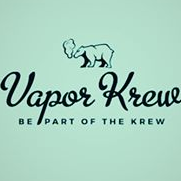 Vapor Krew is a Vape Shop based out of Orlando Florida, most known for our 14.99 30ml's out of our selection of 200+ Premium Ejuice's. Our main goal is to provide smokers an opportunity to kick the habit and start a new, healthier lifestyle vaping. We also cater to the advanced vapors including mech mods, box mods, rebuildables(Rda, Rta, Rdta's) and supplies to ensure an enjoyable and safe vaping experience. Since 2014, we have been growing and expanding across Florida allowing people around the world improve their lifestyles and live a longer, healthy life.